Socialism is a growing force within the Democratic Party. Its membership has ballooned from 7,000 to 37,000 members since the 2016 election, per the NY Times, and has given us candidates such as Alexandria Ocasio-Cortez and Bernie Sanders. 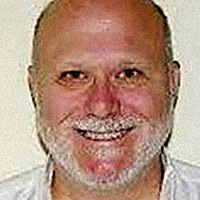 Socialists have endorsed Barack Obama and pushed agenda items such as Medicare for all, guaranteed income, abolishing ICE, and distancing America from Israel. According to Gallup, the far left wing of the Democratic party has affected the views of the entire party. For the first time since they started asking this question in 2010, Democrats have a significantly more positive image of socialism than they do of capitalism. Fifty-seven percent of people who Identify as Democrats have a favorable view of socialism, vs. 47% with a positive view of capitalism (it wasn’t a one-or-the-other question, so the answers total more than 100%). While the number of Democrats supporting socialism is about the same as two years ago, the capitalism numbers fell from 56% down to 47%. Interestingly, each of the socialist candidates running in Democratic primaries on August 7th lost, but that doesn’t change the fact that socialism is increasing its influence in the party and especially the critical party issues. 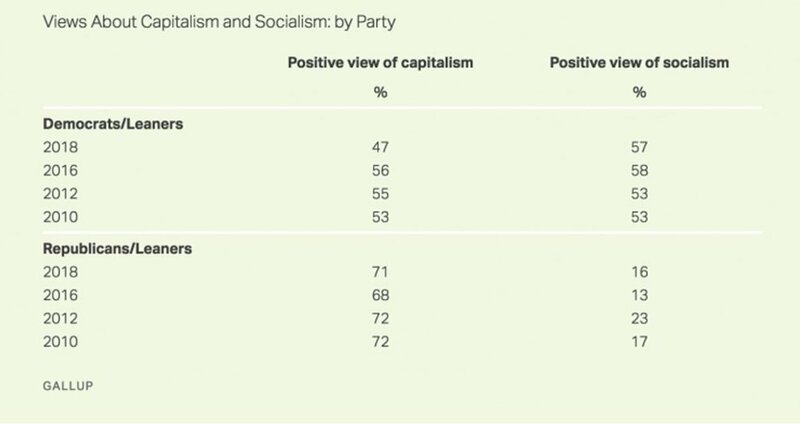 As one would expect, Republicans’ views regarding capitalism are entirely different than the Democrats, with 71% having a positive view of capitalism and only 16% a positive view of socialism. This makes sense when one looks at GOP issues such as strong borders, eliminating Obamacare, reducing taxes, and a close relationship with Israel as the best ally. 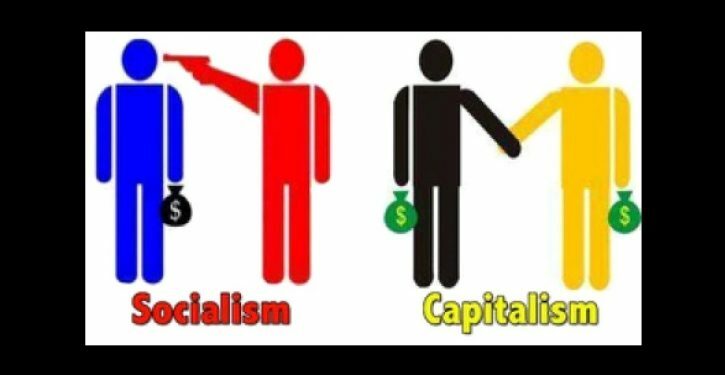 These positions in the U.S. are anathema to socialist positions. Not surprising is the fact that the drop in the favorable view of capitalism comes from the young, where only 45% have a positive view of capitalism. 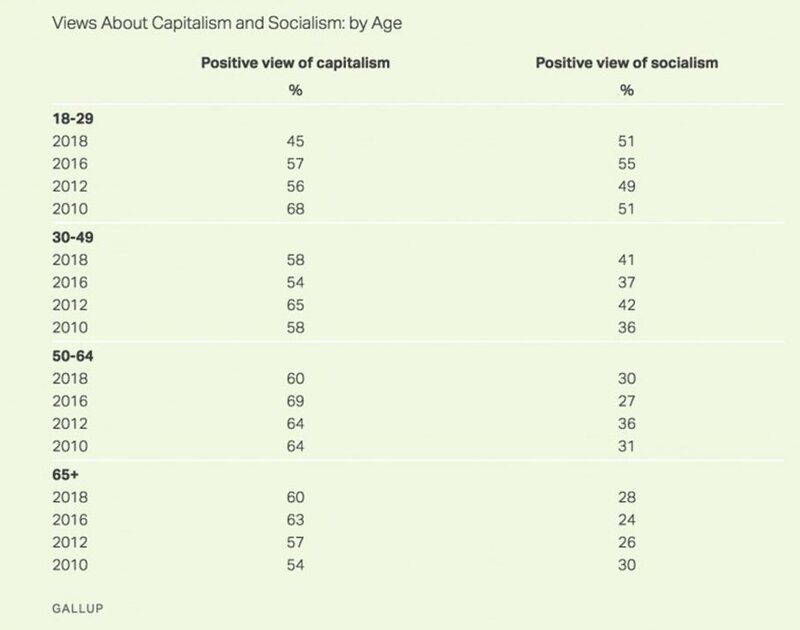 Actually, the young adults’ favorable view of both capitalism and socialism dropped in the past few years, but the capitalism drop was more significant, from 57% to 45%, than socialism, which dropped from 55% vs. 51%. Which may be indicative of a growing antagonism toward politics in general, and could indicate an opportunity for either party to make a convincing case to younger voters. The older the voter, the more likely they are to reject socialism, most probably because they have seen first-hand that it is a repressive system that has never worked wherever it has been implemented. Socialism breeds mediocrity. It takes from some to give to others, leaving a poor-quality middle. And without the incentive to better oneself that capitalism provides, innovation is stunted. This latest Gallup Poll is indicative that Republicans have to do better explaining the economic renewal brought about by Trump’s capitalistic policies. 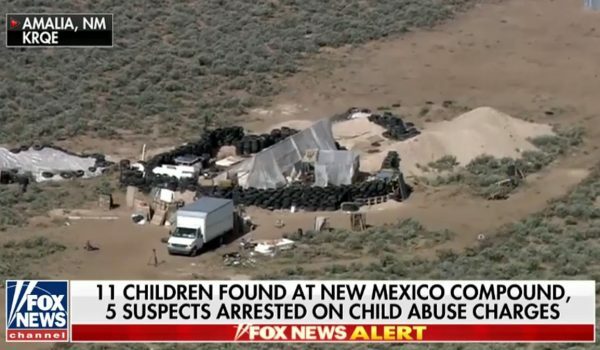 This will not only sell the GOP but sells the basics of capitalism; when government gets out of the faces of business via lower taxes and deregulation, the economy thrives, the population makes more money, and business innovates. In other words, capitalism works.